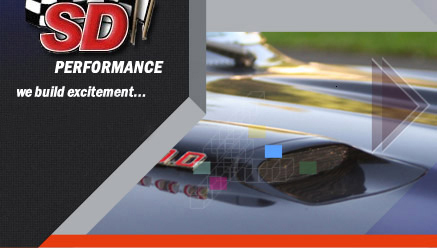 This is the web site of SD Performance. We collect name and address. The information we collect is used for internal review and is then discarded and . If you do not want to receive e-mail's from us in the future, please let us know by sending us an e-mail at the above address, calling us at the above telephone number or write to us at the above address. With respect to Ad Servers: We do not partner with or have special relationships with any ad server companies. From time to time, we may use customer information for new, unanticipated uses not previously disclosed in our privacy notice. If our information practices change at some time in the future we will post the policy changes to our Web site to notify you of these changes and provide you with the ability to opt out of these new uses. If you are concerned about how your information is used, you should check back at our Web site periodically, we will post the policy changes to our Web site to notify you of these changes and we will use for these new purposes only data collected from the time of the policy change forward. If you are concerned about how your information is used, you should check back at our Web site periodically. End of 2018 is fast approaching!! Northwind Intake manifold Dyno Testing.